This website has been developed by the Shire of Nannup, with broad consultations throughout the community. 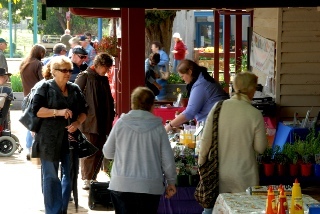 Markets form part of the intrinsic fabric of a community and you are invited to visit the fortnightly Saturday markets in Nannup from 8.30am to 12 noon. Click here to see market dates. Located in the main street there is a quirky mix of Farmers and community markets, giving you the chance to talk to the producers and find out where your food comes from, pick up a present, a book or piece of artwork. Don’t forget the loose change to support the odd community raffle! If you are interested in having a stall contact Val Gazzola on 9756 1087 to book your space. Health regulations apply to those selling food and fresh produce. During major festivals and events stallholders may trade in this area on standard Saturday market dates until 1pm.